I’m excited to be taking part in a birthday party today! Sugarpea Designs is turning 4…so we’re all sharing birthday cards today. These Pretty Peonies are what I chose because they’re so gorgeous – and what an elegant card they can make, with only ONE pencil!! Watch the video below or click HERE to see it in HD on YouTube. This is all the supplies needed – how easy! 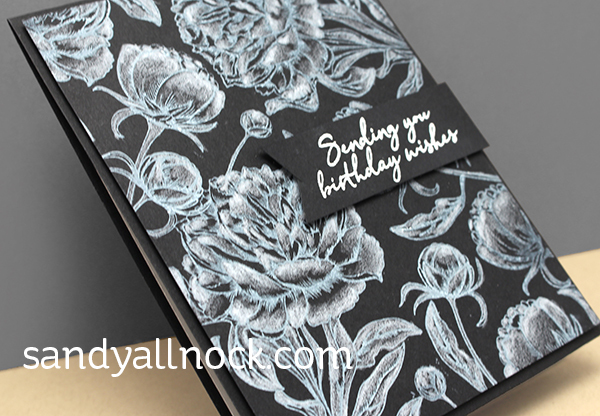 The card is popped up on black cardstock, with a grey liner inside. SALE: To celebrate, SugarPea Designs is offering a coupon code: BDAY04 for customers to receive 15% off their entire purchase AND a FREE 4×8 stamp set with any purchase (valid until April 7th 11:59 EST). PRIZE: SugarPea Designs will be giving away (4) FOUR $40 gift certificates to the SugarPea Designs shop! Winners will be randomly chosen from all the comments left along each stop of the hop. Comments will close on April 7th 11:59 PM EST with winners announced on April 8th. Beautiful card . Thank you. Oh, WoW! How stunning is that?!! Just ONE pencil?!! Amazing!! So glad to see you at SugarPea!! This is a beautiful card. So lovely and creative! These Peonies are absolutely stunning!! Sandy again you are the TOP of the list in my book! You really are magic with a colored pencil. I love this whole look, and it’s cards like this that are the reason I have a nubbin of a white pencil. 😀 Thanks for sharing your talents with us. Gorgeous card! I love the black and white design! What a beautifully stunning card! Love the black and white and your tips and info in the video! What an elegant card! Gorgeous in white only! I FINALLY bit the bullet and bought the Bostitch Quiet Sharp 6 on sale on Amazon for around $18 – it is AMAZING!!!!!! It’s huge, but quiet and stops automatically when the pencil is sharpened and it actually sharpens the pencils to a nice, sharp tip. Sandy, thanks for the advice and I will start listening to you sooner!!! Stunning card! 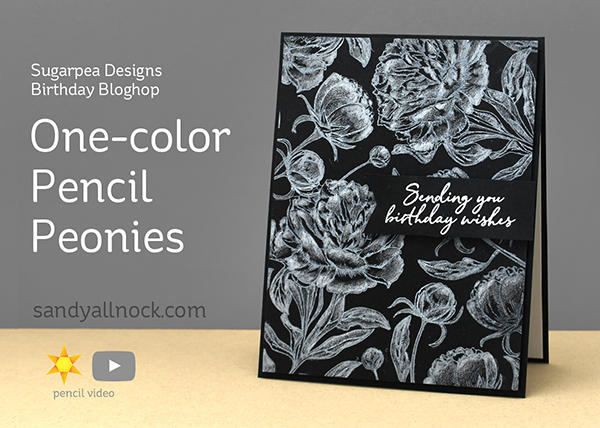 The white pencil on the black cardstock is so elegant looking. Thanks for demonstrating your technique for this. Stunning! You are one of my coloring idols, I LOVE your creativity, this card is amazing! This is a real stunner Sandy. 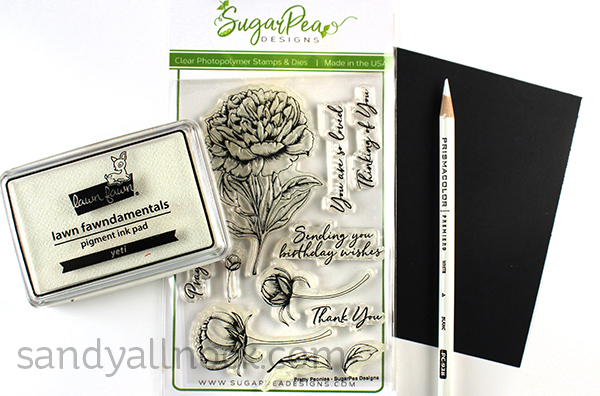 Such beautiful pencil work and a gorgeous flower stamp. L♥VE! wow ! this is stunning !! This is very beautiful! Love this design idea. Wow! This is beautiful! What a great way to use this gorgeous stamp! This is stunning, Sandy! Fabulous video tutorial. Ooo . . . this is gorgeous! Black and white can be such an elegant combo, and it definitely is here!